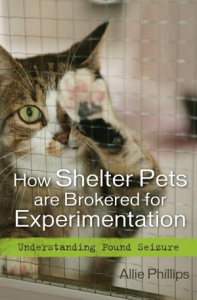 Before I interviewed Allie Phillips in 2013( Animal Cafe) I had never heard of pound seizure. Once I knew about it, I couldn’t forget it. That municipal shelters could sell lost, relinquished, adoptable animals to research labs turns the concept of “shelter” on its head. Sadly, in the intervening years, nothing has changed. 10 that allow the individual municipality to decide. Oklahoma stands alone in requiring shelters to give up pets when research labs and universities ask. You can see more data on each State’s pound seizure laws here. The US is not alone in allowing this practice, as Canada’s Animal Alliance related in an interview. While the EU has banned animal testing for cosmetics, recent news revealed by claiming a need to test for safety due to workforce exposure during manufacturing, some are making an end-run around the ban. All of this tells us what we already knew in our heart of hearts: If we want this changed, it is up to you and me. Once we achieve this goal, as with any other goal met in animal welfare, we’ll need to fight to keep it in place. This work requires that you know what to do and how to proceed without getting tripped up by red tape and closed doors. I’m happy to say that Allie Phillips’ Understanding Pound Seizure makes certain the time and effort you put in won’t be wasted. Here’s your blueprint. You can listen to my interview with Allie on the podcast below, and read more on pound seizure and about the author at AlliePhillips.com. Have you ever run into this practice at your local animal control? Now that you know about it, does any past experience make you wonder if that’s what happened? Please share. GASP!! I'm utterly horrified by this! I volunteer at a county shelter & have never heard of this practice. I need to find out more about my state & whether or not this practice goes on. Thank you for this informative post, as hard as it is to learn about this awful practice! @dancingdogblog Thank you for bringing awareness to this! @dancingdogblog I've never heard of pound seizure before and I am so upset reading that this exists. @RufusandDelilah I felt the same a couple of years ago! And they're using our $$ to do it & keeping it a secret. So happy to see this isn't allowed in our state of SC, Hope other states soon change this. Such a very sad situation. Thanks for increasing awareness & helping people understand how they can help. @petsarefound It's sad and horrific, I agree Annette. Thanks for spreading the word -- until the majority know that this is going on and the details of it, they don't realize it could mean their lost dog or their neighbors lost cat could get swept up in this practice. Didnt know about this...now I need to learn more. Thank you for sharing! OMG I had no idea about this. When you hear shelter, you assume protection. I was surprised when I found out relatively recently that some of our local shelters still euthanize, let alone give animals up for research. @talenthounds We all make assumptions about so many things, I know! In this pound seizure practice who would think that it is still happening in the 21st century? It sounds like something they did when children were kept in workhouses. To your point about local shelters -- if they are "open shelters", meaning if they take all animal give-ups, they usually have a kill for space policy. So many now have great connections with rescues and no-kills who can save some adoptables. Wow. I had no idea. Thanks for sharing this important information. How terrible! I had no idea about this issue. Wow! This is an eye-opening post. I am ashamed to say that my state is listed among the ones with no regulations. Sadly, it does not surprise me. It's a surprising, well-hidden fact of life for shelter animals in so many States. Knowing is the beginning of advocating for change. Hopefully if you find yourself meeting those experiencing something strange at a municipal shelter, you'll be able to suggest the book and/or the podcast if they want more info =) Thanks for stopping by! It's so important to get the word out. It should be banned in all states. Thank you for this post and raising awareness of pound seizure. Through posts like this, maybe one day we will see the change that is so needed. Great post, Mary! Thanks for raising awareness of this important issue... together we can bring change! @pawesomecats You're welcome =) Thanks for stopping by! Apparently Oregon doesn't have a law on this issue. We normally have pretty strict animal rights laws.